Are Milk and Dairy Friend or Foe? Milk has been a staple and trusted food for generations. Until now… Milk is increasingly being blamed for a growing number of diseases and conditions, including allergies, intolerance, type 1 and type 2 diabetes, heart disease, autism, osteoporosis and autoimmune diseases. So great have the changing attitudes been towards milk that whole industries have sprung up offering milk and milk-based products claiming to remove the “bad” things from milk or include additives to make up for milk’s deficiencies. Consumers can choose from Low fat, Skim, No fat, lactose-free, A2, flavoured milk, calcium-enriched milk or milk fortified with vitamin D, stanol esters and Omega-3 fats. So is there any scientific evidence to suggest milk is bad for you? Are you hurting yourself and your loved ones by giving them milk? Are the designer milk-based products better for you? And do we need them at all? With so many mixed messages, who is telling the truth? Who do you believe? And what is the truth? 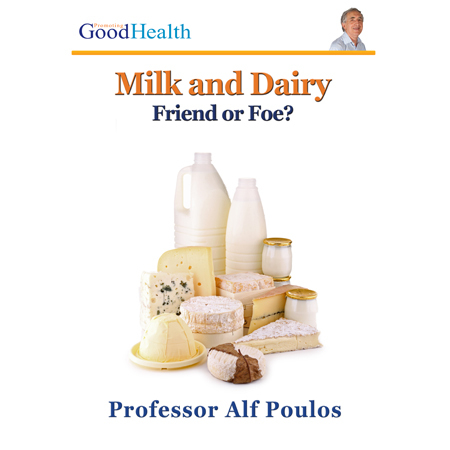 In “Milk and Dairy: Friend or Foe?” Professor Alf Poulos looks at the scientific evidence for and against and provides you with the information you need to make sense of it all.